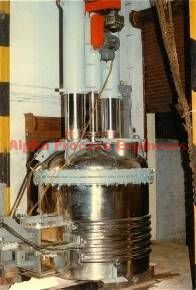 ALPEN Agitated Nutsche Filter Drier is used for solid-liquid separation. In the manufacture of various chemicals (including Toxic), Agricultural chemicals (including Insecticides, Pesticides), Dyes and Intermediates, Pharmaceutical products, Food products, such products requiring absolute hygienic working condition etc. The Agitated Nutsche Filter Drier is also called Filter Expression Drier, is the latest version of the Agitated Nutsche Filter Drier introduced globally and has the track record of producing very good results in all the application industries listed above. The FED - Filter Expression Drier - gives excellent separating qualities with good medium filtration products, optimum filtration times and, if used only for filtration application, gives lowest residual moisture in the cake when compared with other similar systems.